Feeding the hungry. It’s an easy cause for all us to understand and to support. Nevertheless, there’s one simple question that can bring such a universally favored mission to a grinding and confusing halt: How? It’s a question that Parker, Smith & Feek Principal, Vice President, and Food Practice Group Leader Josh Hedrick is helping local nonprofit, Food Lifeline, to answer. About two years ago, Josh was attending a Puget Sound Business Journal event and watching Tom Douglas, a Food Lifeline Board Member, give a speech. It was convenient timing; Josh was on the lookout for a new charitable cause with which to give back after serving six years as board president of a different non-profit, preferably related to his work in the food industry. He was seated next to Food Lifeline’s Controller, as well as a client who actively donates all their leftover food to the organization. The dots started to connect in his head, and Josh reached out to Food Lifeline President, Linda Nageotte. Not long after, Josh went and met her at the Hunger Solution Center in South Seattle, which serves as the group’s distribution center, and got hooked on the mission. Following several cups of coffee with numerous other sitting members, Josh was offered a seat on the board. He began to learn just how complicated that simple question of, “How?” really is. Organizations that address food insecurity operate in a world of constantly changing factors that can significantly alter their circumstances. They need to be aware of and take into account changes in legislation, healthcare, demographics, economics, and more to maintain their sustainability and continue to work towards their mission. The biggest obstacle is finding the food supply. This is where Food Lifeline specializes. Josh describes them as the food bank for other food banks; essentially, they aggregate and repackage food donations from restaurants, processors, grocery stores, etc., and distribute it to local food banks. Many local companies already participate, including Tom Douglas’ restaurants, Molly’s Salads, and Ellenos Greek Yogurt. Even Starbucks has joined the cause with a donation program benefiting Food Lifeline. As Josh points out, securing donations, particularly a reliably steady supply of donations, is a tricky undertaking. “Say you’ve got around 300 local participating locations, and each manager orders more product than they need initially to cover the unknown demand, even though they’re not trying to create more waste. Food Lifeline gets our refrigerated trucks gassed up and sent out to pick up all of the donations, and within a couple of days, you see it on the food banks’ shelves. There are also other groups vying to claim a piece of that supply, adding another layer of complication. Many of these “competing” interests are other nonprofits or food banks looking to accomplish the same goal of feeding the needy. Produce or community supported agriculture boxes also compete for products, paying farmers just a bit more than nonprofits like Food Lifeline can afford, and selling the “imperfect” food at a discount compared to normal market price. Yet, even these companies are working towards the same objective: providing healthy food options to those who otherwise would not be able to afford them. There’s a fine line between competitor and partner when it comes to food insecurity. Creativity, adaptability, and thinking ahead are key to Food Lifeline’s strategy, and where Josh focuses on creating value. But, with significantly expanded warehouse space comes extra work to support it; Food Lifeline needed to greatly increase their fundraising and sponsorship efforts to keep up. Josh lent a helping hand to two annual events aimed at raising serious funds – the very glamorous SAVOR, featuring the region’s finest chefs and wines, and the more casual Dress Down For Hunger. 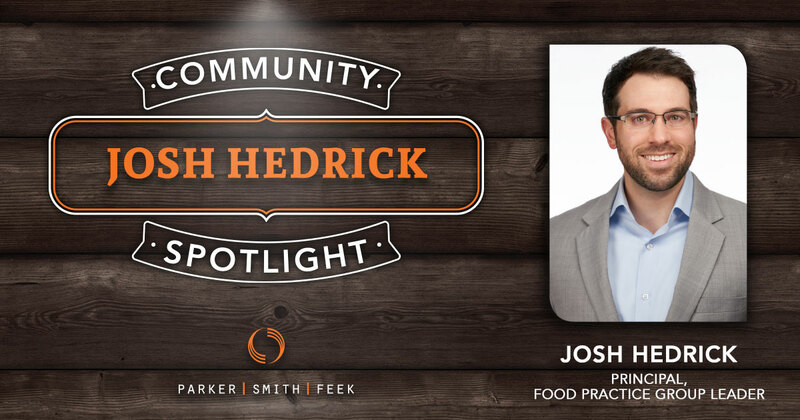 Josh helped facilitate Parker, Smith & Feek sponsoring a table for the latter, allowing him to share the group’s mission with clients and other colleagues in the food industry. His work isn’t all black tie galas or making calls, though. He teamed up with fellow Parker, Smith & Feek Vice President Mariana Ancira to organize a volunteer day with a dozen other coworkers. 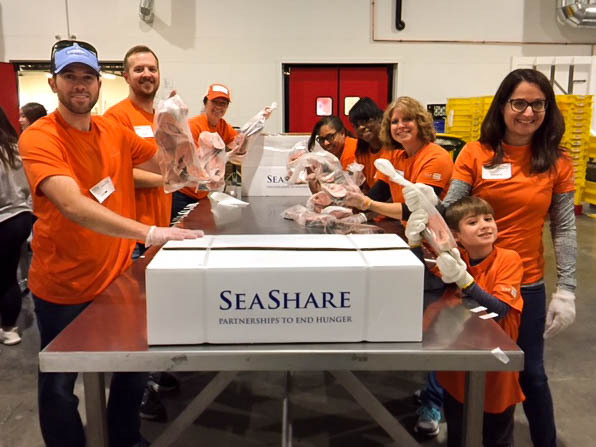 The group dedicated their Saturday morning to repacking pallets of frozen salmon into individual portions for the food banks’ shelves. Josh also lends his professional expertise to the organization, sitting on their risk committee. As a specialist in food distributors and the associated risks, he is confident he can lend a hand to the groups’ controller and operations staff. Food Lifeline is a nonprofit with different exposures and liabilities than a for-profit food distributor/packer/store. However, they still have to mitigate product recalls, protect their auto fleet, work with hazardous chemicals and heavy machinery, and more. If not properly addressed, these exposures could lead to extremely costly claims or legal fees and prove disastrous for a nonprofit organization like Food Lifeline. Josh’s expertise helps ensure that doesn’t happen. To learn more about Food Lifeline, volunteer, or to get involved, visit foodlifeline.org.